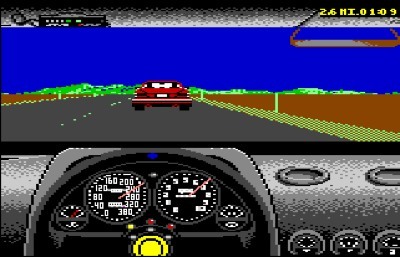 Driving games have held the fascination of geeks and non-geeks alike since they first began to appear – decades ago (can you believe it!) This list takes a look at fifteen of the hundreds of games that have made their debut on our computer screens, arcades, and TVs. These are the most influential of the bunch. Probably the game that started the whole thing off for many, pole position was created as an arcade game in 1982 by Namco. After a period, the game was eventually picked up by Atari, who exported the game worldwide. Pole position set the bar for all future racing games with its fluid frame rate and solid ‘behind the car’ graphics. The pseudo F1 style spread it’s appeal, and set the ‘behind’ perspective at the forefront of racing gaming; which is still in evidence today with the likes of Need for Speed. Influenced: outrun, pitstop, ridge racer series. There had been a few ‘top down’ racers before, but spy hunter turned out to be the one which would kickstart a new enthusiasm in this perspective. The aim was to drive up a road and negotiate traffic and obstacles coming down. The twist was that the player could transfer from a car to a boat when the road ran out. The player could also fire weapons; a first for race gaming. This concept was taken to the limit with the 1997 release of Grand Theft Auto. Influenced: A.P.B, GTA 1 & 2, The Spy Who Loved Me, Nitro. 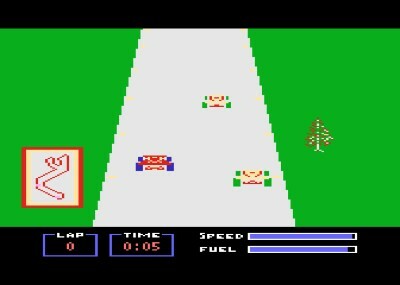 Two years after pole position, the ‘behind the car’ formula took another performance injection with the release of this game on the C64. The game boasted two player racing without any noticeable slowdown; a feature almost unheard of at the time. It was also one of the first games to to take advantage of repairable car ‘damage’ as a strong selling point. The Pitstop formula was later a heavy influence in games such as ‘Lotus Esprit Turbo Challenge’ (amiga). Influenced: Indy 500, Gran Turismo. 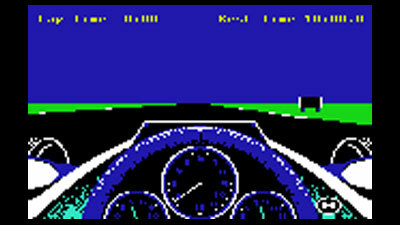 Revs is considered the very first racing simulator, and was released on the BBC Micro in 1984. 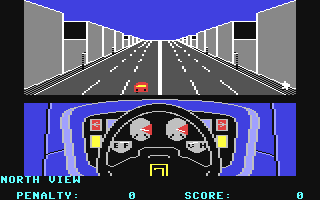 The game featured the view first ‘in car’ view and boasted the first rear view mirror effect. 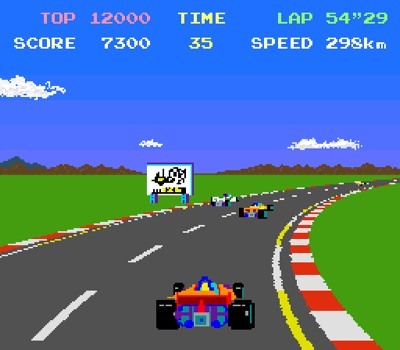 Although superseded by the likes of Geoff Crammonds ‘Formula One Grand Prix’ (amiga), the concept of the in-car racer is still the staple of games today. Influenced: Grand Prix Circuit (1988), Vroom, Formula One Grand Prix (1991). This contender was one of the first to successfully update the racing genre with the inclusion of bike racing. The smooth ‘behind the bike’ graphics and pseudo 3D sprites took the model to another level, and paved the way for games such as Outrun and Enduro Racer the following year. Influenced: outrun, super-hang-on. Way ahead of it’s time in every way, Lotus Esprit was the very first game to use a true 3D open world environment to drive around. 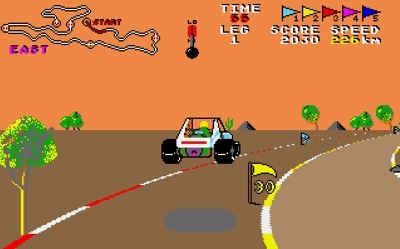 The map was very large, and the player drove the vehicle using a unique method of controlling an on-screen car using an on-screen driving wheel and dash. 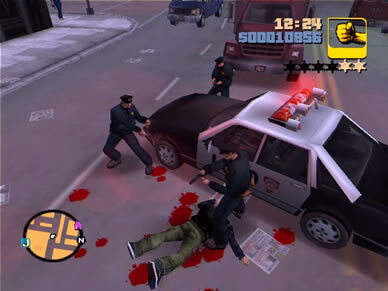 Although unknown at the time, the game model became the major influence in games such as Driver, and most notably the Grand Theft Auto III + series. 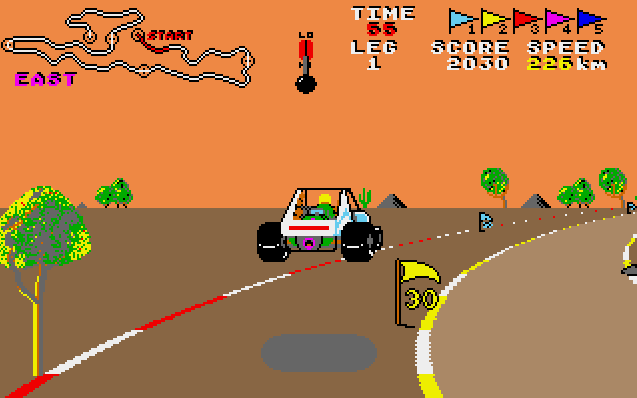 Taking the ‘behind view’ racing genre and adding more speed, buggy boy was one of the first arcade racers to feature pickups along the way. Various obstacles were placed on the track which were designed to ensure the driver didn’t reach the end of the lap. To add to this, several ‘time’ bonuses were often placed in unusual places around the track; resulting in much side-to-side track action rather than just as driving as fast as possible in straight lines. Other features included for the first time: getting to perform two-wheel stunts, high jumps, and driving over bridges and through tunnels. Influenced: Powerdrift (1988), Super mario kart (1992), Wipeout, Crazy Taxi. An odd mix of bike riding, off roading and show jumping. The aim was to drive a dirt bike over and around a series of obstacles; most notably high hedges; to reach the finish. Another ‘behind the vehicle’ game, the gimmick this time was that the bike spent as much time in the air as it did on the ground. 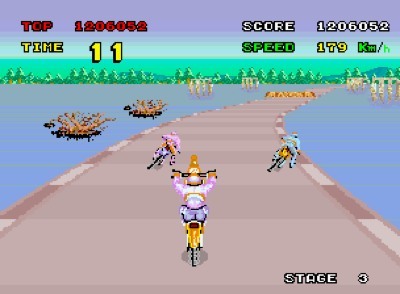 Although basic by today’s standards, Enduro racer was also the first game to offer virtual off-road action. Influenced: Motorstorm. 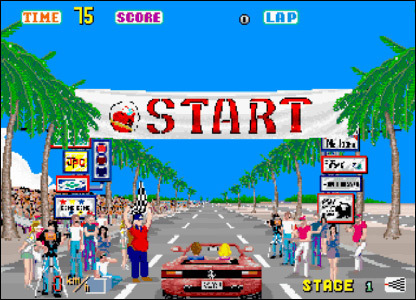 The definition of ‘arcade racing’ for many years and probably still one of it’s greatest influences. Outrun was the first game to offer the player different routes to reach the goal; allowing the player to customize each play to suit their gaming talent. Outruns game engine was very fast, featured many different vehicles and landscapes, various selectable in-game soundtracks. Influenced: Turbo Outrun, Chase hq, ridgeracer, burnout. 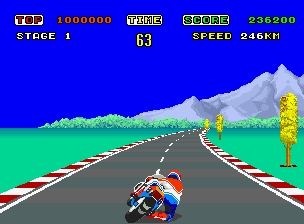 The world of virtual 3D was launched with this 1988 racer. Although the game engine was very slow on ported computers (most noticeably on the c64 version), the graphics let the player move around a dynamic forced 3D vector environment for the first time in a driving game. The player would also get to perform virtual stunts; including a 360 degree loop, and a banked turn. Unlike Turbo Esprit; which used fake 3D; Hard Drivin’s use of vectors would be the benchmark of gaming for many years to come. 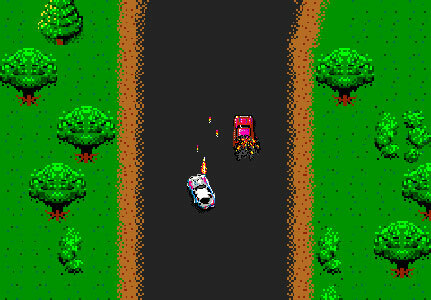 Its influences would include the much better attempts at vectors including: Stunt car racer (1989), Race Drivin’. Until the Test Drive series, most ‘in car’ racers were firmly fixed on the F1 scene. Test Drive took this formula to new heights and for the first time, enabled drivers to experience the thrill of driving along ‘real’ roads in ‘real’ cars. 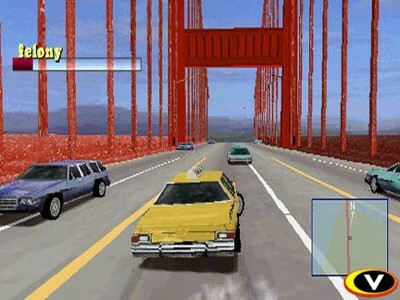 The games had the gimmick of allowing the police to chase speeding offenders, and opening the landscape up to reveal cliffs and drops. This sequel, The Duel, also allowed a chase car to race the player along the road, either controlled by another player or by an intelligent computer A.I. Influenced: V-Rally, Gran Turismo. By 1993, the racing game was a well established genre. Namco, arguably the ‘father’ with Pole position, made way for the next generation by offering the first polygon driven racer – a platform the new breed of games consoles could take care of very well. The series was interesting for its use of landscapes, A.I. opponents and the fast and furious action. 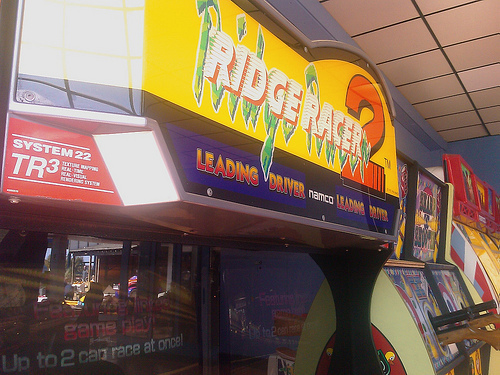 Ridge racer was also one of the first games to offer the player multiple camera angles to play from, including ‘in-car’ and ‘behind’ views. Influenced: Ridge Racer series. Off road gaming had not developed much since Enduro Racer, with the exception of the vector racers and Ivan Stewarts Ironman Racer, so the appearance of Sega rally on the new polygon platforms was a welcome addition. The game offered exciting 3D environments and much sand and dirt action. Computer A.I. was much improved but the single looping tracks would make way for non-looping landscapes with followers such as Colin McRea Rally. 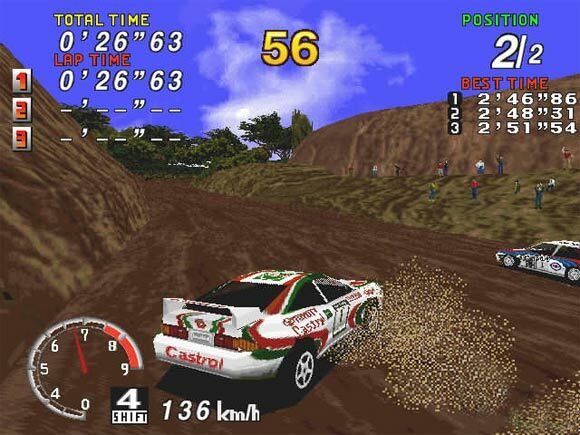 Influenced: Colin McRea rally (1998), V-rally, WRC, Motorstorm. Since Pit Stop in 1983, the opportunity to fix and customize the racing experience was always a good gimmick for racers. By combining polygon racing with ‘real world’ mechanics and physics, the makers of Gran Turismo broke the mould. The circuits (although still in the looped style) were detailed and smooth, and care handling was taken to a new level by designers Polyphony Digital. Each circuit had barriered sides to enable players to bounce off each other, creating very fast paced racing. Cars could be chosen from many real-world manufacturers and highly customized to match the players skill and driving success. Influenced: Forza motorsport. The original Driver took a major leap forward in the open world driving experience. 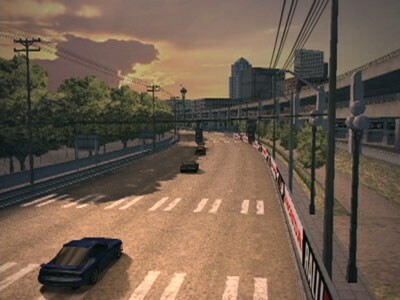 Although driving was still largely limited to driving along main and side roads, the freedom of driving on non looped free-forming landscapes captured the imagination of todays game designers. Even now, Driver is still seen to have made the biggest impact on the open-world driving experience. Influenced: Driver 2, GTA III, The Getaway, True Crime. Polygon worlds were now huge, and almost for the first time since Activisions ‘Hunter’ (1991), a player could now exit one vehicle and enter any other, and drive around a free formed open world landscape. With the restriction finally taken off the driving experience, players could now drive up, down and off any road, and on any terrain. Cars could be repaired and customized with body color (and in later games, with nitrous and suspension jacks), and every car model had its own characteristics. Although not a ‘driving game’ in it’s strictest sense, the 3D GTA games have taken the model of the ‘Driver’ Series and made it their own. Influenced: Vice City, San Andreas, Mercenaries, Saints Row, Scarface.